seven − one = Required Please enter the correct value. The DJIA Index rebounded from yesterday's steep sell-off, pushing higher from improved economic data at home and moves by Europe to abate concerns over Greece's pending debt payment to the International Monetary Fund. 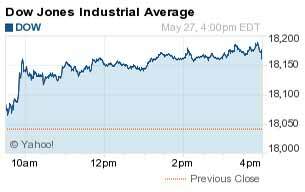 The DJIA added 121 points, while the Nasdaq gained 73 points. The S&P 500 Volatility Index (VIX), the market's fear gauge, slipped 5.69% on the day. Market Recap: The U.S. stock market was on the rise thanks to strong performances from healthcare and technology stocks and new hopes that Greece can avoid default over its IMF debt payments. According to reports, the nation and its creditors are working on a deal to avoid default. The news pushed shares of National Bank of Greece (NYSE ADR: NBG) up 12.8%. However, EU financial ministers have dismissed such claims. Luxury Losses: It was a rough day for luxury retail, with the exception of Tiffany & Co. (NYSE: TIF), which gained 10.3%. Shares of Michael Kors Holdings Ltd. (NYSE: KORS) shed 24%, falling to a two-year low after a weak earnings report and cuts to its 2015 outlook. This was the company's slowest revenue growth rate since its 2011 IPO. A report by Kors on falling demand and the impact of the West Coast port shutdown also affected the company's rivals. Shares of Coach Inc. (NYSE: COH) slipped nearly 3.3%, Kate Spade & Co. (NYSE: KATE) fell 4.6%, and Fossil Group Inc. (Nasdaq: FOSL) dropped nearly 6.5% on the day. Technology Tug-O-War: The battle for Flipboard, a custom newsreader application for mobile devices, is heating up. Reports indicate that both Google Inc. (Nasdaq: GOOG, GOOGL) and Yahoo Inc. (Nasdaq: YHOO) have entered the running to acquire the tech company. Since March, Flipboard was tied to acquisition rumors from Twitter Inc. (NYSE: TWTR); however, talks stalled, allowing the two other technology giants to enter discussions. On Tap Tomorrow: On Thursday, investors will keep their focus on U.S. crude oil inventory levels, as the Energy Information Administration (EIA) will announce data from last week. Oil stockpiles have declined for three straight weeks, even though production levels remain very high. Companies reporting earnings Thursday include Abercrombie & Fitch Co. (NYSE: ANF), GameStop Corp. (NYSE: GME), Golar LNG Ltd. (USA) (Nasdaq: GLNG), and Seadrill Ltd. (NYSE: SDRL). Stocks to Watch No. 1, YHOO: Yahoo stock slipped 1.3% today after Evercore ISI analysts downgraded the stock's target price from $55 to $48. The investment firm raised new concerns after the Internal Revenue Service said last week that companies like Yahoo may face stricter rules involving tax-free spin-offs. The company is looking to conduct such a spin-off with its stake in Alibaba Group Holding Ltd. (NYSE: BABA). Stocks to Watch No. 2, MCD: Shares of McDonald's Corp. (NYSE: MCD) were in focus after the company announced plans to stop reporting monthly sales data and raised concerns over the U.S. Department of Justice's probe into alleged corruption by FIFA officials. McDonald's was a FIFA World Cup Sponsor for the 2014 tournament in Brazil and is currently expected to be a sponsor for the 2018 FIFA World Cup in Russia. The company has already been reeling from controversy involving its meat suppliers in Asia, while its share price has tumbled due to economic woes in Europe and changing dietary demands of U.S. customers. Stocks to Watch No. 3, AAPL: Shares of Apple Inc. (Nasdaq: AAPL) offered the largest boost to the S&P 500, gaining nearly 1.9% on the day. The company will likely to offer its first yen-denominated bonds in June, as the firm looks to exploit falling interest rates in the region. The issuance will likely top ¥200 billion ($1.6 billion) in bonds, which will be used to finance shareholder returns and the expansion of operations in the region. News also emerged that Apple executive met with CBS Corp. (NYSE: CBS) CEO Leslie Moonves to discuss a potential deal over Apple TV. Stocks to Watch No. 4, BRCM: Shares of Broadcom Corp. (Nasdaq: BRCM) jumped 22% on news that the chipmaker may soon be purchased by Avago Technologies Ltd. (Nasdaq: AVGO). Broadcom is one of the largest semiconductor firms in the world, with a market cap north of $31 billion and clients that include com Inc. (Nasdaq: AMZN), Google, and Samsung (OTC: SSNLF). Don't get embarrassed by not knowing what's going on in the markets – stay informed by following us on Twitter @moneymorning.